I've posted pictures of Maraes before, but we were learning about the parts of the Marae in my Māori language class and I found it super interesting! The Marae is a sacred meeting house and is the basis of traditional Māori community life. Types of events that occur in a Marae are celebrations, weddings, funerals, and tribal reunions. Every iwi (tribe) has their own Marae in the area where the tribe originates. Even today, if someone from the iwi dies, they will be sent to their Marae to be buried and the family will travel there for the funeral. Pakehas (Europeans) may not enter the Marae unless they have been invited by a Māori Elder. Every Marae represents an ancestor of the iwi that it belongs to. 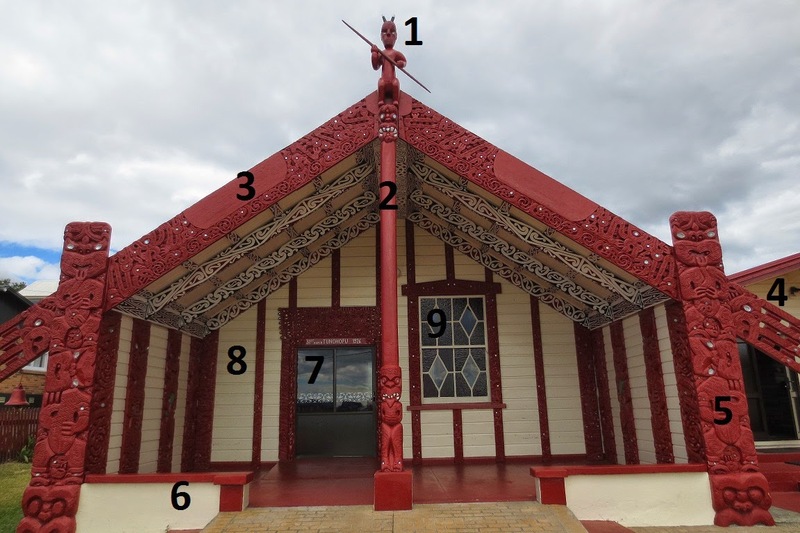 In the above picture, every number corresponds to an important part of the Marae. Nō Amerika ahau. I tupu ake ahau i Calumet, Michigan. E noho ana au kei Highbury ki waenganui tetahi whanau Māori. No reira. Ngā mihi nui tēnā tātou. I am from America. I grew up in Calumet, Michigan. My parents are from Michigan. My ancestors are from Finland. I am currently living in Highbury with a Māori family. Conclusion. Many salutations to us all. Tena koe Katie. Ko Jesamine Wanoa ahau. He kai awhina ahau mo te kura a Tu Maia Whanau ki Pakuranga. Tino ataahua te mahi tenei. Ka nui te matauranga. Ka mau te wehi! Well done my friend. I'm very proud of what you have achieved in your learning here. The best part about it, is that you have chosen to share our language. You are therefore a taonga to us who are Maori. You are an integral part of keeping our language alive. Thankyou for your manaakitanga, tautoko and kaitiakitanga of our language. Mihi arohanui ki a koe.